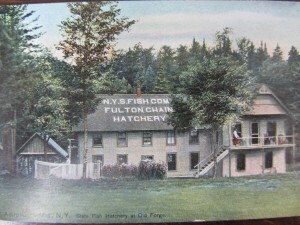 State Fish Hatchery at Old Forge. Courtesy of Town of Webb Historical Assn. 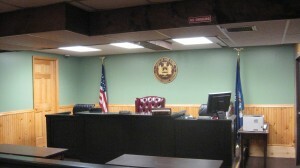 The renovation project on the Town of Webb Courthouse on Route 28 in Old Forge began on March 1 under the supervision of Town Justice Jack Graham. The renovations, which according to Graham will be completed in three phases, one per year, allows physical space for the judges and court clerks to operate while the work is being done. Every work day, a construction crew from Mid-State Correctional Facility in Marcy, under the supervision of a corrections officer, travels to Old Forge to work at the courthouse. Two of the inmates are contractors by trade. Those who aren’t are eager to learn the trade, according to Graham. “It’s helping them and helping us,” he said. Graham expressed gratitude for the work they are doing, saying it wouldn’t have been possible to get this project approved if construction crews had to be contracted for the job. Phase One, now in progress, started at the bench area. Dark paneling is being replaced with blonde wainscoting up to chair rail height, with a medium shade of green paint above the chair rail. This entry was posted in admin and tagged Wende Carr on March 28, 2013 by Wende Carr. The Oneida County Tourism Board of Directors passed a resolution in support of the Adirondack Scenic Rail-road’s efforts to rehabilitate rail service from Remsen to Lake Placid at a meeting held on Tuesday, March 26. The board, which had previously sponsored the Adirondack Scenic Railroad North Country Regional Economic Impact Analysis, passed the resolution with a vote of seven ayes, one abstained, and three absent. The resolution cites the mixed-use management objectives of the Remsen-Lake Placid Travel Corridor Final Management Plan which supports infrastructure and access to the corridor essential for New York’s winter sports industry, specifically snowmobiling. It also supports the rehabilitation of the remainder of the infrastructure from Remsen to Lake Placid for spring, summer, and fall rail service, while preserving usage of the rail corridor for winter sports, which would support economic development through increased tourism. This entry was posted in admin and tagged Dana Armington on March 28, 2013 by Dana Armington. The Town of Webb and Inlet snowmobile trails will close on Sunday, March 31, following one of the best snowmobile seasons the area has seen in years, according to Tim Pylman, head of the Webb Snowmobile Trail Maintenance crew. 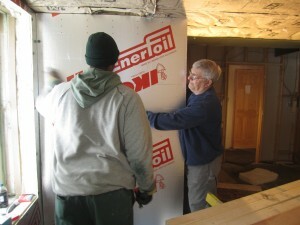 “We had a slow start, but once the snow started coming, we never stopped. We had two groomers out last night (March 27)—which is unusual for this late in the season. We have had an excellent season,” Pylman said. Though Pylman said trail activity this week has been light, over last weekend they saw plenty of use as sledders came to the area in droves to take advantage of the good late-season conditions. It’s been a stark contrast to the conditions of the 2011/2012 season. Pylman said his crew put the snow fences away last year on March 19 after daytime temperatures reached the 70 degree mark. Pylman’s records of last year show that the ice was out of Bald Mountain Pond on March 25, White Lake on March 26, and Fourth Lake on March 30. He said the average date of ice-out on Fourth Lake is April 18. This entry was posted in admin and tagged Marianne Christy on March 28, 2013 by Marianne Christy. McCauley Mountain Ski Area will be open Friday and Saturday, March 29 and 30 from 9 a.m. to 4:15 p.m. and on Easter Sunday, March 31 from 10 a.m. to 4:15 p.m. Skiers can enjoy late-season discounted lift ticket rates of $10 for adults and $5 for children. McCauley currently has a base depth of 18 to 46 inches and an average of 20 open trails. CAP-21 invites the public to a meeting at the Old Forge Library on Wednesday, April 10 to discuss ideas and concepts pertaining to establishing a Central Adirondacks Laboratory for Environmental Studies (CALES). The meeting will be held from 6 to 8 p.m. in the library’s Community Room. This entry was posted in admin and tagged Cap-21 on March 28, 2013 by admin. 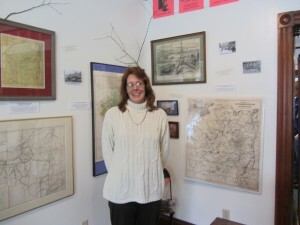 Kristy Graham Rubyor of Woodgate began her position as Assistant to the Director at the Goodsell Museum in Old Forge on Tuesday, March 26. Rubyor will assist Director Kate Lewis with all administrative and in-house duties related to the museum, home to the Town of Webb history. “I have a passion for history of all kinds—especially local history. And growing up here—and having my family be such a big part of it—makes it really nice to dig into,” she said. The Goodsell Museum is currently open Tuesday through Saturday from 10 a.m. to 3 p.m., or by appointment. 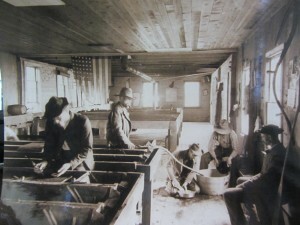 It is located at 2993 State Route 28, across the road from the Old Forge post office. This entry was posted in admin on March 28, 2013 by Dana Armington. The Town of Webb Union Free School District was spared a 16% reduction in aid by the state following the efforts of State Senator Hugh T. Farley. “I was very concerned that the Governor’s proposed budget would have resulted in a 16% cut in state aid for the Town of Webb School District. Several of our small Adirondack schools were facing large cuts in aid, and the restoration of these funds was one of my top budget priorities,” Farley said. Farley said that increasing funding to the Town of Webb School became a priority following recent meetings with Superintendent Rex Germer, Webb students, and Webb officials. “I am pleased to report that the final budget provides an increase of 13.63% in state aid for the Town of Webb School District. I know that these funds are very important to the community,” Farley said. The Senate passed the school aid provisions of the state budget on Wednesday, March 27. The Assembly is scheduled to pass these provisions on March 28.